Advocacy groups and social justice leaders have responded in force in the wake of the Department of Homeland Security disclosing that thousands of children have been separated from their families at the U.S.-Mexico border. Some of the strongest criticism has come from international human rights officials. Hussein called the immigration policy “government-sanctioned child abuse” and called on the U.S. government to end the practice. President and director-counsel of the NAACP Legal Defense Fund, Sherrilyn Ifill, questioned President Trump's moral values. As political figures continue to raise their voices, advocacy groups are encouraging others to do the same. From class-action lawsuits to a national protest being held June 30, here are three advocacy groups mobilizing supporters to take action. The organization’s website reads: "We know the government will bend to public pressure because they have already reunited one asylum seeker with her child after more than 65,000 activists like you signed the petition. Now we need to make sure our members of Congress take action to end this cruel practice once and for all. Let's reunite every family the Trump administration tore apart – and make sure this never happens again." 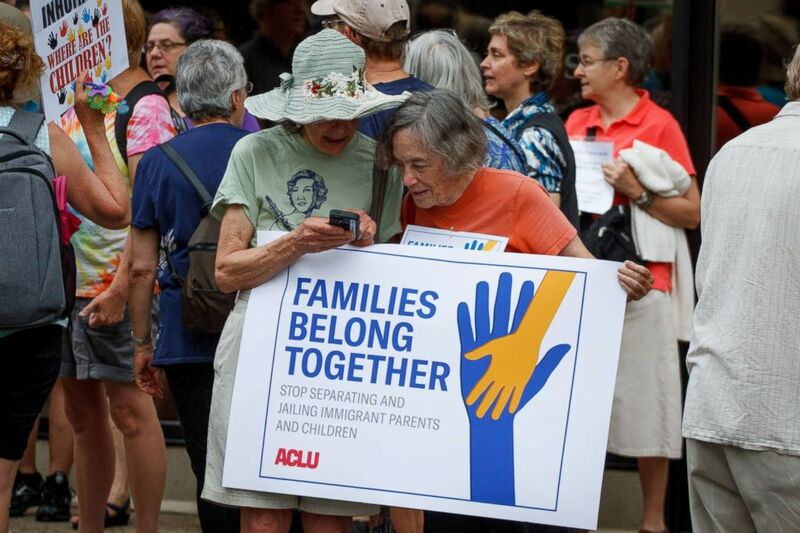 Two women hold a sign at a rally near Philadelphia's Immigration and Customs Enforcement office, organized by the ACLU in opposition to policies which separate children from their families when entering the U.S. illegally, June 1, 2018. Last week, celebrity Chrissy Teigen and singer-songwriter John Legend announced that in honor of President Trump's 72nd birthday, their family of four would donate $72,000 each. Teigen also encouraged her followers to donate, and in two days raised more than $1 million. Focused on helping immigrant children who arrive at the U.S. border alone, the Young Center for Immigrant Children's Rights told ABC News in a statement it will be launching the "Immigrant Child and Family Rights Project" to assist both unaccompanied children and children separated from their families. As a part of the project, the Young Center will be hiring two new attorneys to spread their efforts to assign child advocates for minors separated from parents. One attorney will be stationed at the border and the other in New York "where many of the young, separated children are placed." In addition, a new social worker will be hired to work in San Antonio to work on family-separation cases referred to the Young Center in Texas. "For children who've been separated from their parents, our role is to advocate with the Department of Homeland Security to reunify the children with their mothers and fathers and to ensure that the mothers and fathers are able to speak on behalf of their children," the Young Center told ABC News in a statement. "Parental rights are intact." Young Center, which has eight locations in the U.S., is "working closely with child welfare organizations around the country—to communicate to Congress and the Department of Homeland Security that separating children from their mothers and fathers leads to serious harm to children’s health and development." In addition to partnering with the ACLU in a lawsuit against the policy, Children's Rights has created a toolkit to guide those who wish to help end the "abhorrent" policy. "Needlessly ripping kids, toddlers, babies away from their parents is inhumane, barbaric and unconstitutional. An Administration that purports to uphold family values is callously inflicting devastating trauma on children and families in service of its punitive immigration policies," said Sandy Santana, the organization's executive director.